locr starts the new year with a great development. We spent some time last year optimizing the content we deliver to inform our partners and prospects about the locr Geomarketing services and how they enable marketers to enhance their location-based marketing activities. First, the landing page has a new more visual design that displays our most prominent products GEOservices and Personalized Maps. You now can scroll through to a category called “What’s new?” directly on the home page. Here you will find our take on key industry topics, trends in the marketplace and the latest news about our products, services and technology. Our new structured Products and Application pages let you dive into the world of Geomarketing, with real life examples and data-driven results that demonstrate the value of location-based marketing solutions from locr in a visual, engaging manner. Finally, this update introduces a completely new section called Resources that provides you with high-quality insights, statistics and best practices. Here you can instantly download white papers and e-books! Tired of the same old places…? What do you think about the new website design? 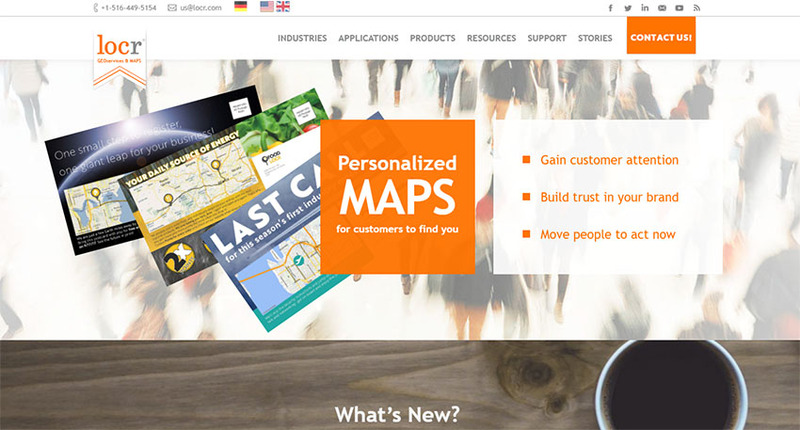 We’re happy to hear your feedback and thoughts on Geomarketing solutions!